English author and art critic; born in London May 22, 1858; educated at University College School and University College, London. He began his training as art critic on the "Pall Mall Gazette" (1883-90), for which he wrote articles on the works of G. F. Watts, R.A., and Henriette Ronner. In 1890 he was art critic on the "Daily Graphic," and in 1891 art editor and part founder of "Black and White." In 1898 he was appointed editor of the "Magazine of Art," in which post he remained until 1905, when the publication ceased. 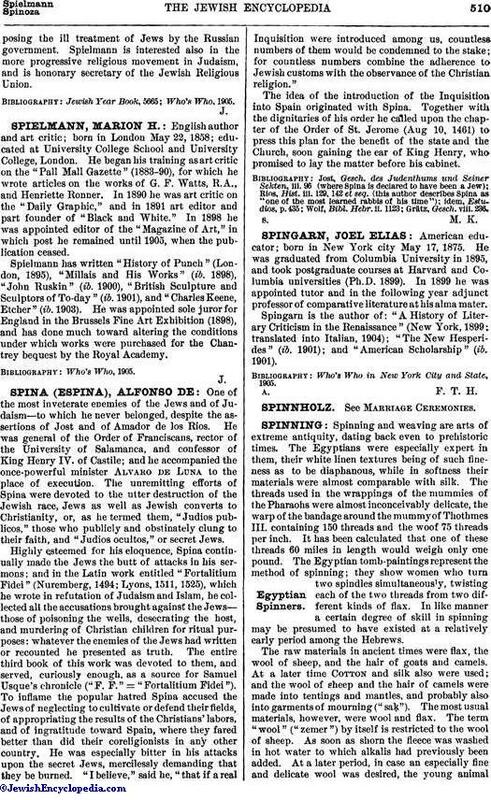 Spielmann has written "History of Punch" (London, 1895), "Millais and His Works" (ib. 1898), "John Ruskin" (ib. 1900), "British Sculpture and Sculptors of To-day" (ib. 1901), and "Charles Keene, Etcher" (ib. 1903). He was appointed sole juror for England in the Brussels Fine Art Exhibition (1898), and has done much toward altering the conditions under which works were purchased for the Chantrey bequest by the Royal Academy.